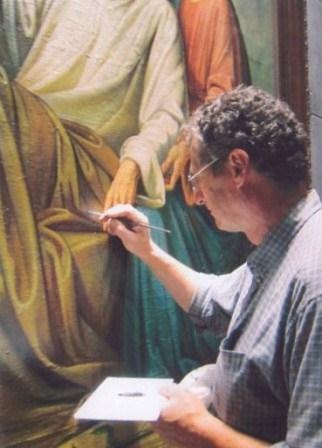 Legris Conservation, Inc. is a skilled group of experienced and professional conservators, technicians and administrators all of whom are dedicated to the restoration, conservation and preservation of fine art. We draw on our many contacts with related professionals in the public and private sectors to provide helpful advice and to complete solutions to for our clients. All staff at Legris Conservation abide by the Canadian Association for Conservation of Cultural Property / Canadian Association of Professional Conservators' Code of Ethics. No treatment is performed before treatment proposal and working schedule are prepared. Prior to commencement of work, all details of the proposed treatment are confirmed with the client. Our conservators document each artwork before and after treatment, using digital colour photography. Each artwork that is treated in our studio has a written report that states its condition before treatment; combined with a written treatment record detailing the steps and materials that were used during the treatment procedure. Legris Conservation Inc. · Ottawa 613-727-1234 · Montreal 514-270-5665 · ottawa@legris.ca · © 2010 Legris Conservation Inc. All rights reserved.